The allure of the Southwest comes across in the rough earthiness of the generous, antique, copper medallions in these earrings. 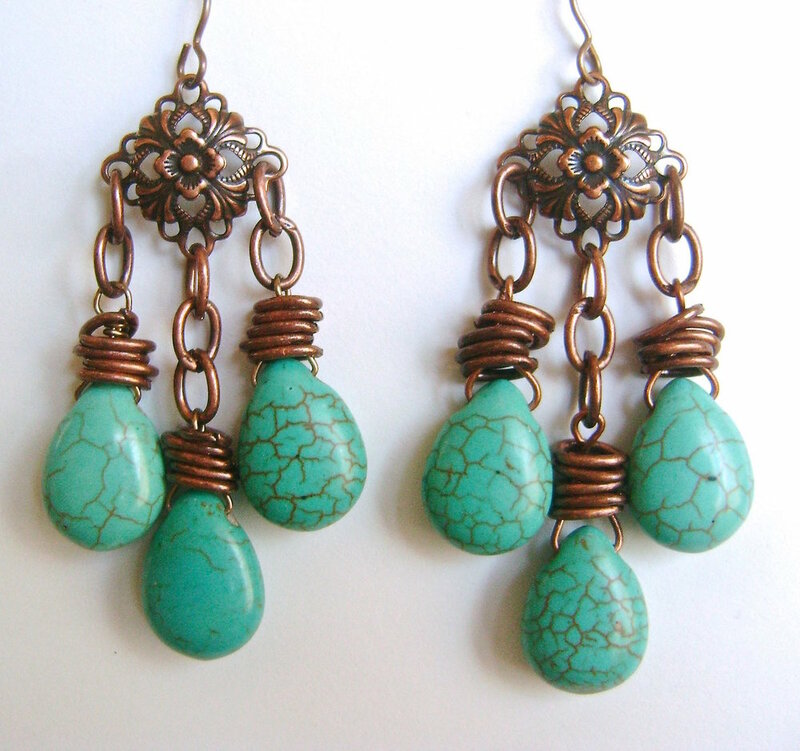 The bright turquoise of the mottled, briolette beads adds contrast and interest. The filigree accent is the anchor for dangling pieces of chain which hold the beads. There’s no fancy wire weaving involved here. The chunky hoops of copper above the beads are links from the chain. Make these earrings in less than an evening. step 1 - Cut 22 gauge wire to measure 3””. 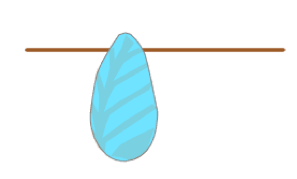 Insert the wire into the bead with half an inch extending out the left side. step 2 - With your fingers press the two wires up against the top of the bead. step 3 - With needle nose pliers positioned from back to front, or front to back, pinch the wires together. This will point both wires upward. step 4 - Hold the spot where the wires meet between round nose pliers. 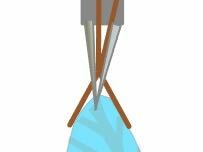 With your fingers, press the long wire over the top of the pliers creating the first step of a loop. step 6 - Hold the loop and short stem with needle nose pliers. step 7 - Wrap the long wire around the base three times, working toward the bead. Use pliers to straighten the loop. step 8 - Trim the excess from the short and long wire ends as close to the work as possible. Smooth out any rough edges with needle nose pliers. Make five more of these wrapped beads. step 9 - Open five links from the chain. Disconnect them from each other then close them. Slip them over the loop above the bead. step 10 - Attach three chain links to the center of the filigree piece and two links on each side. step 11 - Open the links and attach the bead loops. Connect an earring wire to the hole in the top of the filigree.